For other uses, see Yeoman (disambiguation). A yeoman /ˈjoʊmən/ was a member of a social class in England and the United States. It is also a military term. The term is first recorded c. 1300. Its etymology is unclear. 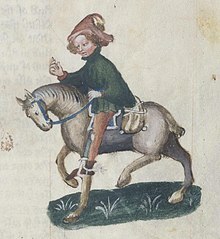 It may be a contraction of Old English iunge man, meaning "young man" (compare knave, meaning "boy"), but there are alternative suggestions, such as derivations from an unattested *ġeaman (a hypothetical cognate of Old Frisian gaman, from gea- "province") meaning "villager; rustic". In early recorded uses, a yeoman was an attendant in a noble household; hence titles such as "Yeoman of the Chamber", "Yeoman of the Crown", "Yeoman Usher", "King's Yeoman", Yeomen Warders, Yeomen of the Guard. Geoffrey Chaucer's Canterbury Tales shed some light on the yeoman's social standing in the late 14th century. 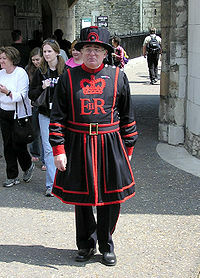 The yeoman in The Canon's Yeoman's Tale is a "servant" to a cleric, once finely dressed but now impoverished. In The General Prologue, the Knight is accompanied ("served") by a yeoman who "knew the forest just as he knew his home...this was a hunter indeed." This yeoman has a bow, arrows and a coat and hood of "forest green", as does the yeoman in "The Friar's Tale", who is a bailiff of the forest. The Ellesmere Manuscript contains an illustration of the Canon's Yeoman. William Caxton's printing also contains a woodcut engraving of a yeoman. In the oldest stories of Robin Hood, such as A Gest of Robyn Hode, Robin Hood is a yeoman, although later retellings make him a knight. According to Sir Walter Scott's Ivanhoe, Robin Hood's Band of Merry Men is composed largely of yeomen. The later sense of yeoman as "a commoner who cultivates his own land" is recorded from the 15th through 18th centuries. Yeomen farmers owned land (freehold, leasehold or copyhold). Their wealth and the size of their landholding varied. The Concise Oxford Dictionary states that a yeoman was "a person qualified by possessing free land of 40/- (shillings) annual [feudal] value, and who can serve on juries and vote for a Knight of the Shire. He is sometimes described as a small landowner, a farmer of the middle classes". Sir Anthony Richard Wagner, Garter Principal King of Arms, wrote that "a Yeoman would not normally have less than 100 acres" (40 hectares) "and in social status is one step down from the Landed gentry, but above, say, a husbandman". Often it was hard to distinguish minor landed gentry from the wealthier yeomen, and wealthier husbandmen from the poorer yeomen. Yeomen were often constables of their parish, and sometimes chief constables of the district, shire or hundred. Many yeomen held the positions of bailiffs for the High Sheriff or for the shire or hundred. Other civic duties would include churchwarden, bridge warden, and other warden duties. It was also common for a yeoman to be an overseer for his parish. Yeomen, whether working for a lord, king, shire, knight, district or parish, served in localised or municipal police forces raised by or led by the landed gentry. Some of these roles, in particular those of constable and bailiff, were carried down through families. Yeomen often filled ranging, roaming, surveying, and policing roles. In districts remoter from landed gentry and burgesses, yeomen held more official power: this is attested in statutes of the reign of Henry VIII indicating yeomen along with knights and squires as leaders for certain purposes. In the United States, yeomen were identified in the 18th and 19th centuries as non-slaveholding, small landowning, family farmers. In Southern areas where land was poor, like East Tennessee, the landowning yeomen were typically subsistence farmers, but some managed to grow some crops for market. Whether they engaged in subsistence or commercial agriculture, they controlled far more modest landholdings than those of the planters, typically in the range of 50–200 acres. In the North, practically all the farms were operated by yeoman farmers as family farms. Thomas Jefferson was a leading advocate of the yeomen, arguing that the independent farmers formed the basis of republican values. Indeed, Jeffersonian Democracy as a political force was largely built around the yeomen. 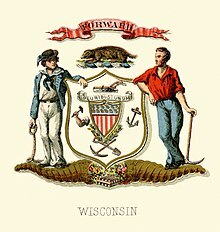 After the Civil War, organizations of farmers, especially the Grange, formed to organize and enhance the status of the yeoman farmers. The yeoman comprised a military class or status (usually known as in the third order of the fighting class, between squire and page). By contrast, in contemporary feudal continental Europe, the divide between commoners and gentry was far wider: though a middle class existed, it was less esteemed than the yeoman of England of that time. The 'yeoman archer' was unique to England and Wales (in particular, the south Wales areas of Monmouthshire with the famed archers of Gwent; and Glamorgan, Crickhowell, and Abergavenny; and South West England with the Royal Forest of Dean, Kingswood Royal Forest near Bristol, and the New Forest). Though Kentish Weald and Cheshire archers were noted for their skills, it appears that the bulk of the 'yeomanry' was from the English and Welsh Marches (border regions). The original Yeomen of the Guard (originally archers) chartered in 1485 were most likely of Brittonic descent, including Welshmen and Bretons. They were established by King Henry VII, himself of Welsh descent, who was exiled in Brittany during the Wars of the Roses. He recruited his forces mostly from Wales and the West Midlands of England on his journey to victory at Bosworth Field. A specialized meaning in naval terminology, "petty officer in charge of supplies", arose in the 1660s. The Yeomanry Cavalry and Imperial Yeomanry were military units in the 18th and 19th centuries. In the U.S. Navy and the U.S. Coast Guard, the enlisted rating of yeoman describes an enlisted service member who performs administrative and clerical work ashore and embarked aboard vessels at sea. They deal with protocol, naval instructions, enlisted evaluations, commissioned officer fitness reports, naval messages, visitors, telephone calls and mail (both conventional and electronic). They organize files and operate office equipment and order and distribute office supplies. They write and type business and social letters, notices, directives, forms and reports. In William Shakespeare's Hamlet, Prince Hamlet states his under-appreciated ability to write elegantly in a particular situation had done him "yeoman's service". In Thomas Malory's tale of Arthurian legend Le Morte d'Arthur, Sir Gawain states that he was made a yeoman at Yule. The Yeomen of the Guard (1888) is a Savoy Opera by Gilbert and Sullivan. In The Magician's Nephew by C.S. Lewis, part of the Narnia cycle (1955), the magician Uncle Andrew complained about Jadis' behavior and mentioned a cousin Edward who frequented pawn shops and was in the yeomanry. The Dr. Seuss book The 500 Hats of Bartholomew Cubbins includes a "Yeoman of the Bowmen", a master archer who shoots a hat off the title character's head. In Elizabeth Moon's The Deed of Paksenarrion fantasy novels, the followers of St. Gird (many of whom are farmers) call themselves the "Yeomen of Gird". In Hunter S. Thompson's The Rum Diary, one of the two characters Thompson had based on himself was named Yeoman. In the American TV series The Love Boat (1977–1987), former actor Fred Grandy's character, Burl "Gopher" Smith, is introduced at the start of each episode as "Your Yeoman Purser". In the American TV series Star Trek, yeomen are mainly female (although sometimes male) enlisted personnel who assist higher-ranking officers, consistent with U.S. Navy usage. Yeoman Janice Rand is a notable example. The Mass Effect video game series includes Yeoman Kelly Chambers (female Cerberus crewman in Mass Effect 2) and Yeoman Copeland (male Alliance Ensign in Mass Effect 3). The opening track to electronic artist Baths' 2017 album Romaplasm is entitled "Yeoman." In falconry, the bird for the yeoman is the goshawk, a forest bird. In computer and information technologies, Yeoman is an open-source web scaffolding tool announced at Google I/O in 2012 by Paul Irish. ^ Chaucer (2009). The Canterbury Tales. Modern LIbrary. pp. 497–500. ^ Chaucer, Geoffrey (2009). The Canterbury Tales (paperback ed.). New York: Modern Library. pp. 6–7. ISBN 978-0-8129-7845-2. ^ Chaucer (2009). The Canterbury Tales. Modern Library. pp. 6–7. ^ Wagner, Sir Anthony R., English Genealogy, Oxford University Press, 1960, pp. 125–130. ^ Cerasano, S.P. ; Hirschfeld, Heather Anne (2006). Medieval and Renaissance Drama in England. Fairleigh Dickinson Univ Press. p. 159. ISBN 978-0838641194. ^ The difficulty yeoman farmers faced in this region was notorious enough that it inspired the lyrics "Corn don't grow at all on Rocky Top; dirt's too rocky by far" in Rocky Top, now one of Tennessee's state songs. ^ DeSaulnier, Jordan. "Johnny Depp Talks 'The Rum Diary'". iamrogue.com. Retrieved 17 February 2015. ^ Osmani, Addy. "Improved Developer Tooling and Yeoman". Retrieved 16 August 2014. ^ "The Web's Scaffolding Tool for Modern Webapps". Retrieved 16 August 2014. Allen, Robert C. Enclosure and the Yeoman (1992) Oxford U. Press 376p. Broad, John. "The Fate of the Midland Yeoman: Tenants, Copyholders, and Freeholders as Farmers in North Buckinghamshire, 1620–1800", Continuity & Change 1999 14(3): 325–347. Genovese, Eugene D. "Yeomen Farmers in a Slaveholders' Democracy", Agricultural History Vol. 49, No. 2 (April 1975), pp. 331–342 in JSTOR, antebellum U.S.
Hallas, Christine S. "Yeomen and Peasants? Landownership Patterns in the North Yorkshire Pennines c. 1770–1900", Rural History 1998 9(2): 157–176. Vinje, Victor Condorcet: The Versatile Farmers of the North; The Struggle of Norwegian Yeomen for Economic Reforms and Political Power, 1750–1814 (2014). Look up yeoman in Wiktionary, the free dictionary. Wikisource has the text of the 1911 Encyclopædia Britannica article yeoman.